I’ll be perfectly honest. As a teacher-owned and operated program, we’ve wondered at times whether we’re shooting ourselves in the foot by not working with a large educational publisher. 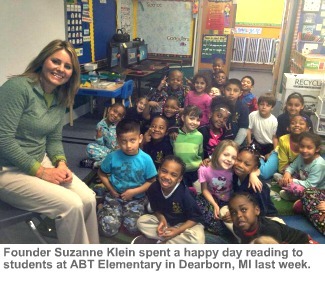 Anyone who has spent time with our founder, Suzanne Klein, knows she is fiercely proud of WriteSteps results and wants passionately to put our lessons in the hands of as many teachers as possible. Our Common Core release, which came out the first day of school last fall, gave us the potential to reach a vast number of teachers in classrooms across the country. Still, could we reach teachers across the U.S. without a big national brand name? The jury is still out. But in the meantime, educational publishers are taking a beating in the news, with reports about changes in the industry that have caused experienced writers and editors to leave their profession in droves. You can read about it yourself in the blog post, Afraid of Your Child’s Math Textbook? You Should Be, by Annie Kheegan, a longtime textbook writer and editor. Her scathing indictment of the field she proudly served for over 20 years is incredibly discouraging. It’s terrible news for our children, just when the Common Core Standards offer the possibility of promising reform. Especially disheartening are the examples she describes of senior executives unwilling to correct serious errors or deliver on their Common Core claims. They’re not changing anything in the curriculum. 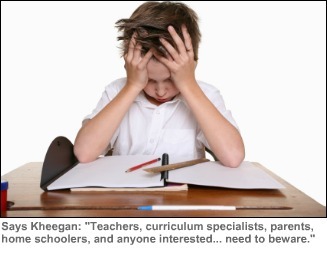 I am dismayed that so many publishers have apparently simply relabeled their programs and handed them to districts with documents stating that they now meet Common Core requirements. We rewrote WriteSteps from the ground up to give students the skills outlined in the new standards. Our lessons were not developed out of desire for profit. They evolved from an experience of fulfillment. Here’s a little about what has gone into them, and who stands behind our name. When I started WriteSteps in 2007, it was a tiny operation. I won’t recap my 18-year evolution from teacher to writing coach to curriculum creator; you can read those details here if you want. I’ll just say that as a K-5 teacher, I found great success teaching writing to my own students, and finally said “yes” to repeated requests that I publish my lessons. Compiling those lessons for publication took a long time. But knowing there’s a world of students finding their writing voices with them is enormously gratifying. And knowing I’ve helped a lot of teachers develop their chops as great writing instructors… well, it conjures up that MasterCard commercial we know and love: priceless. In 2010, I read the Common Core Standards and realized that teaching was going to have to change if states were really going to implement them. I couldn’t single-handedly re-create over 500 lessons to instill Common Core writing skills for students ages 5-11. But I was careful who I brought aboard to help. 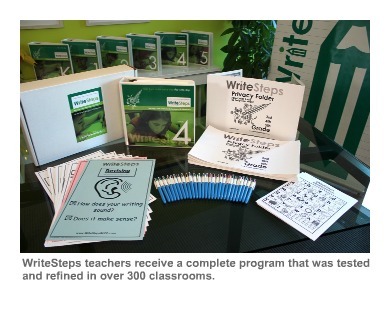 Seven truly outstanding teachers joined WriteSteps to work on our Common Core release. Among them are National Writing Project fellows, literacy coaches, M.A.’s in Curriculum, teachers of the year, and longtime classroom veterans revered for their knowledge and skill. Everyone at WriteSteps is motivated by a desire to serve children and teachers. I know the writers and editors who have worked in the educational publishing establishment are no different. The heartbreak in Annie Kheegan’s blog is palpable. I suppose the big difference at WriteSteps – and the reason I’m glad we took the path we did – is that we’ve been able to safeguard the integrity of our people and our program. I am not kidding – we are driven by excellence, altruism, and service – not the bottom line. For the sake of our children, not to mention the heroic teachers and principals who give the best part of themselves every day at school, I sincerely hope the revelations about educational publishing spark a change in the system. For those who can forgo the need for a big name publisher in exchange for quality, coherence, and Common Core integrity, WriteSteps is here. At the annual conference of the National Association of Elementary School Principals (NAESP), held in Seattle last month, Suzanne’s talk attracted the attention of David Hanson, a principal from North Dakota, who blogs for the NAESP. See his review, entitled “The Write Stuff,” here! Dondi Daugherty is the wizard who arranges all of Suzanne’s national speaking engagements. She takes care of logistics wherever Suzanne travels. That’s five appearances before principals and literacy educators already in 2012! Dondi also makes the updates to our WriteSteps teacher binders and communicates those changes to Todd, her husband and our Tech Guru, so he can make corresponding updates to our online “virtual teacher binder,” eWriteSteps. The two work from their home offices in Las Vegas, Nevada. 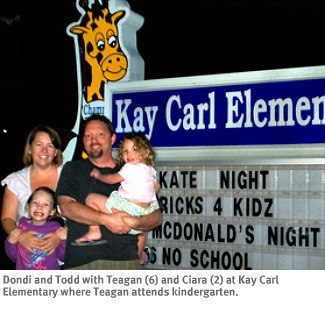 Dondi and Todd have two daughters, Teagan and Ciara, who are six 6 and 2 years old. They are proud that Teagan is among two kindergarteners in her school who were recently honored for learning all of their sight phrases. At the principal’s barbecue honoring her, Dondi and Todd made sure they spoke to their principal about WriteSteps!